One of the key new features of Mac OS X 10.5 Leopard is QuickLook. This features looks inside files and shows you the contents. So instead of seeing a big Ai icon in the preview, you would see the actual graphic contained in the file. The problem is, QuickLook doesn’t support some key file types. SneakPeek Pro fixes that (go to developer’s site). This QuickLook plugin allows you to preview Illustrator, InDesign and EPS documents in the Finder, dialog boxes, cover flow, other applications. 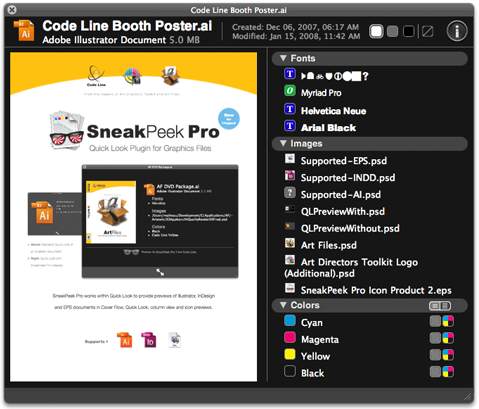 SneakPeek Pro also allows you to see fonts, images and colors used in many CS3 documents. It also supports looking inside Freehand files! This entry was posted on Tuesday, March 18th, 2008 at 8:02 am	and is filed under Promote, Software. You can follow any responses to this entry through the RSS 2.0 feed. Both comments and pings are currently closed.